Rod Hammerton, the former Deputy Chief Fire Officer, steps up to replace John Redmond, who has retired. After a short career in the Royal Navy, Rod joined the fire service in Hampshire in 1992 as a firefighter initially serving at Eastleigh Fire Station, near Southampton. During the next 15 years of service in Hampshire Fire and Rescue Service, Rod served at several stations in in the Portsmouth area and at headquarters before moving to South Wales Fire and Rescue Service to take up the role of Head of Operations. After three years in this demanding role, Rod was promoted to Assistant Chief Fire Officer with responsibility for a number of specialist and technical references including planning for the Olympics, Ryder Cup and the NATO Summit. 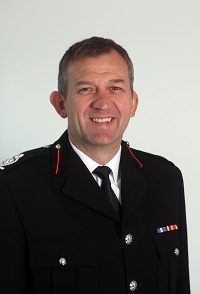 Rod then moved to Shropshire in 2014 to take up role of Deputy Chief Fire Officer. Shropshire Fire and Rescue Service had “a strong track record” to deliver and develop highly innovative solutions to maintain an excellent service in the face of financial constraints, said Mr Hammerton. Financial challenges would continue but more savings would be made as the service strived to improve and understand public need. “The key to this is to engage all the stakeholders whether they be the politicians who lead us, the communities we serve, our partners in public safety or the staff who really understand the business in hand. He said he had “thoroughly enjoyed” his first two years living and working in Shropshire. Originally from Portsmouth, Mr Hammerton is married with three children. The two eldest have just successfully completed university studies while the youngest starts school in September. A former rugby player and keen cyclist, Rod enjoys travelling on two wheels in “the beautiful hills and flatlands of Shropshire.